Alex Proyas and the cast of Gods of Egypt did the best they could do with the source material presented to them, and while it isn’t a terrible movie, it is certainly not one that is in the same league as the Hunger Games franchise that it is trying to replace. With the Hunger Games now complete, and the Divergent series winding down, Lionsgate's executives were looking to launch a new franchise and when Gods of Egypt of was pitched to them, they bit. Unfortunately, things didn't pan out as well as they had hoped, once it was released in theaters. Now, looking for new life. Lionsgate has released Alex Proyas' (Dark City) latest release, Gods of Egypt, which hits the shelves today, on 4K UHD, Blu-ray, and DVD this week. The film, starring Nikolaj Coster-Waldau (Game of Thrones) and Gerard Butler (London has Fallen), is a action/fantasy film set in, you guessed it, Egypt, where gods live and rule among men. King Osiris is the current ruler, and as he prepares to pass along the crown to his son, Horus (Coster-Waldau), his brother, Set (Butler), decides that he will be in charge. After disrupting the ceremony, Set murders his brother and mutilates and exiles Horus. After his takeover, he enslaves the mortals in order to keep them from reaching the final gate in the afterlife. Bek (Brenton Thwaites; Maleficent), a mortal slave, spends years of his life doing hard labor. Eventually, he has had enough, and comes up with a plan to restore Horus as rightful heir and ruler. In the meantime, Ra (Geoffrey Rush; Pirates of the Caribbean), who is Horus and Osiris' father, watches from above, as he hopes everyone involved learns the lessons of what a just ruler needs to know. The film had a lot of things going for, and against, it. First, and maybe the most glaring issue, is the lack of ethnic authenticity of the film. Casting Gerard Butler and Nikolaj Coster-Waldau is what most would think of as odd choices for such a film. However, if you are just going on the acting ability, both actors do an amazing job in their roles and breathe three dimensional life into what could be 2 dimensional cartoon cut out characters. Taking a cue from George Lucas' Star Wars prequel trilogy, Gods of Egypt was entirely filmed on a blue screen with minimal actual set pieces built. Most of the time, I would cringe at this type of filming-making; however, it worked under the careful eye of Alex Proyas. Arial shots, while a bit dizzying at times, looked amazing. At no time did I think that any scenes looked "out of place" or computer generated. It all meshed together wonderfully. The one area that I think really hindered Gods of Egypt was the weak script by Matt Sazama (The Last Witch Hunter) and Burk Sharpless (The Last Witch Hunter). Save for the additions from the actors and actresses, the script was very high brow with very little depth or meaning behind it. Most scenes seemed to exist just to get people from point "A" to point "B" without contributing anything to the overall story. The 4K UHD release of Gods of Egypt is encoded 2160p transfer in 2.40:1 aspect ratio. While the original film was captured in 6K during the post process, they brought down the resolution to 2K. However, the post-processing done on the disc along with the HDR leads to some beautiful imagery. The time, effort, and money spent on the character costumes shine through beautifully on the 4K disc. Breastplates shimmer, and the patterns are sharp and crisp throughout the clothing worn in the film. Compared to the companion Blu-ray included with the set, the film seems to leap off the television screen with beautiful colors and detail showcasing the wondrous world of ancient Egypt that the gods and mortals share together. Blacks are spot on and colors are vibrant and not washed out in the least. Since most modern sound systems can handle the 4K audio mixes used on these discs, Lionsgate went ahead and included the DTS:X audio mix featured on the 4K UHD Blu-ray on the regular one as well. The front speakers do a nice job of handling the dialog for the film, while the special effects are relegated to the the rear and side speakers as well. At times, the special effects audio overpower the dialog, but not enough to take away from the overall presentation. 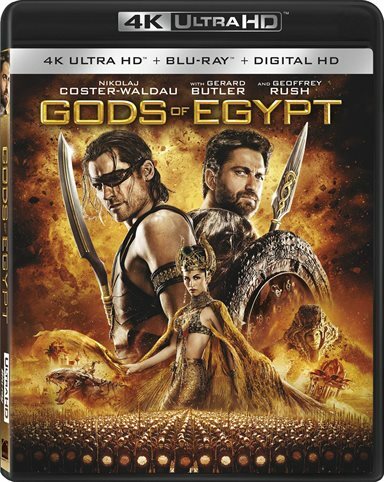 In addition to the 4K UHD rendition of the film, The Gods of Egypt 4K combo pack included a Blu-ray copy of the film, as well as a digital HD copy that can be redeemed in either iTunes or Ultraviolet. To be able to give the best possible presentation of the theatrical film, the extras for the 4K UHD combo pack are relegated to the Blu-ray in the package. Each featurette is around 12 minutes in length and gives some fairly detailed information about what happened behind the scenes in the production — Deleted Storyboards, A Divine Vision: Creating a Cinematic Action Fantasy, Of Gods and Mortals: The Cast, Transformation: Costume, Make-Up and Hair, On Location: Shooting in Australia, The Battle for Eternity: Stunts, A Window into Another World: Visual Effects. Alex Proyas and the cast of Gods of Egypt did the best they could do with the source material presented to them, and while it isn't a terrible movie, it is certainly not one that is in the same league as the Hunger Games franchise that it is trying to replace. Unfortunately, with the box office numbers and audience interest not being there, this film will not become the franchise that Lionsgate had hoped for, but is still worth owning on 4K UHD, as it is beautiful to look at and fun to watch. Download Gods of Egypt from the iTunes Store in Digial HD. For more information about Gods of Egypt visit the FlickDirect Movie Database.